Expectations for Toddlers: What Can Three-Year-Olds Draw? Three year olds love their independence but still need quite a bit of parental and teacher assistance. They begin learning new skills like counting and singing songs. They also begin coloring and practicing their fine motor skills. Free drawing and coloring in coloring books helps children expand their creativity and gives their small finger muscles some dexterity and practice. In the beginning, however, kids can’t jump right in and draw elaborate pictures and concepts. Their drawings start out fairly crude and rudimentary, but as the year continues, they become more recognizable. If you wonder what can three year olds draw, there are a few basic skills most master at this age. They begin by drawing basic shapes. Most children draw large and small circles during their fourth year. Some begin earlier than this, but by three, they master the circle shape. They also mimic adults drawing straight, jagged, or curved lines. Three year olds with exceptionally fine motor skills, or those nearing their fourth birthday begin to draw the cross and "X" shape. Since all objects in the world are made up of different shapes, this is the first step to drawing recognizable pictures. Three year olds begin drawing extremely simple pictures of people. When you think of a stick figure, take away at least half the detail and you’ve got a three year old’s drawing. Usually they consist of a circle head, because they can draw circles. Then, they might have legs and possibly arms. What can three year olds draw in terms of detail? Younger three year olds don’t draw much in terms of detail. They might add eyes to the face with little dots. Right before the fourth birthday, however, some three year olds begin drawing mouths, hands, hair, and feet. By this point, the stick figure is a bit more recognizable as a person. In general, as long as a three year old practices coloring and drawing on a regular basis, their fine motor skills will stay on par. Evaluating drawings from child to child is extremely difficult because children develop at different rates. The easiest way to evaluate, however, is to recognize progress over time. 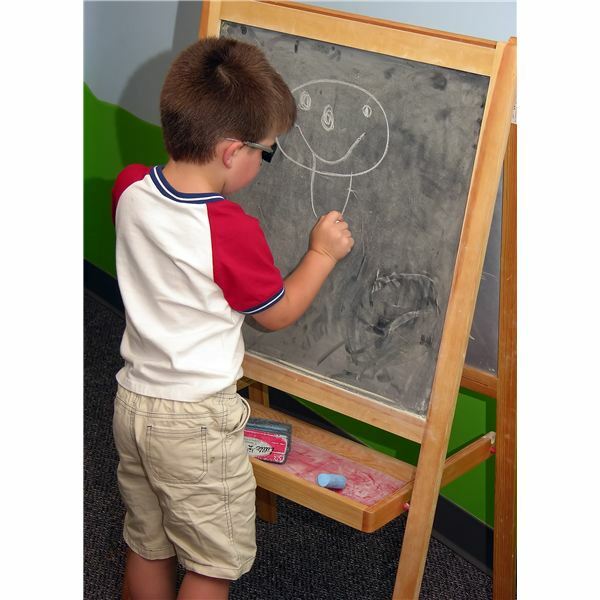 For example, ask the child to draw a circle or a cross and possibly a portrait of themselves. Then, about 4 to 6 months later, have them repeat the activity. Compare the pictures and look for more drawn body parts and a more recognizable shape on the person. Simply seeing improvement marks success. Improvement throughout the year shows development. You might see a body or feet where there was nothing three months earlier. Anyone who questions, "What can three year olds draw?" should remember that sometimes they still simply draw to draw. Three year olds don’t always try to draw recognizable shapes and objects. Give children the opportunity to color and draw often and their fine motor skills will eventually flourish.